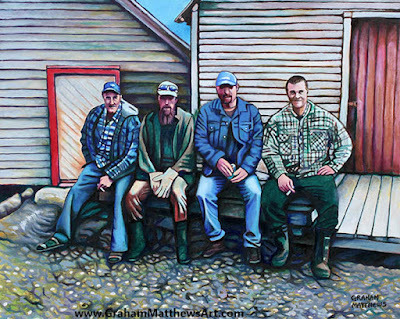 Original painting of four guys from Pacquet, Newfoundland. Depicted is an original painting of four individuals, native to Pacquet, Newfoundland. Pacquet is a small close knit community of less than 1000 people, located on the Baie Verte peninsula. 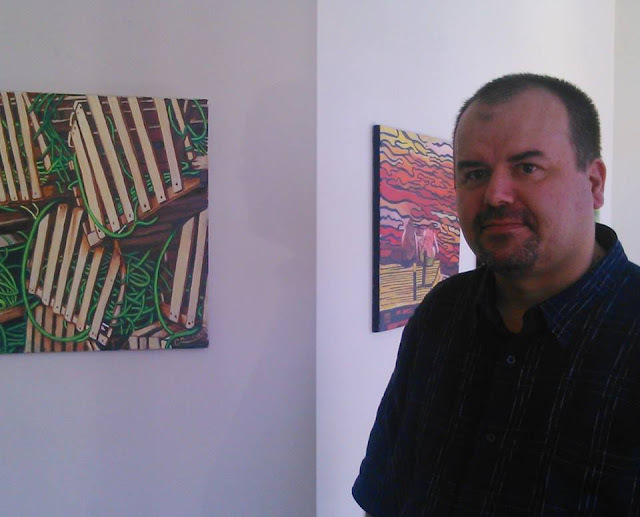 The painting is inspired by a photograph, and is a non-realistic (and partly abstracted and stylized) interpretation. A small printed version was referenced while painting so that the painting would be more about typical outport poses rather than an accurate depiction of the men. I attempted to capture the personalities of the individuals, since I did know them personally at the time. The painting has a laid back mood and their casual poses are typical of how they were often seen, especially when posing for a photo.